“Have you been under the city yet? You’ve heard it’s haunted, right? 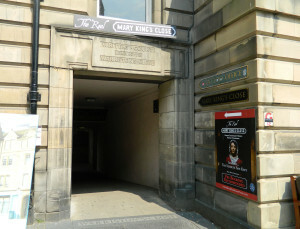 Make sure you check out ol’ Mary’s place before you leave!” These words were told to me by a smiling shop lady on my first day in Edinburgh, Scotland – but variations were repeated by others several times over the week. But first, a short disclaimer: I’m a giant chicken. So no, I did not go on this tour at night and I did not sign up for any ghost hunting tours, although there are a BUNCH offered throughout this very old city. Instead, I signed up for a 1 hour day tour at “The Real Mary King’s Close,” which has its entrance on the Royal Mile. 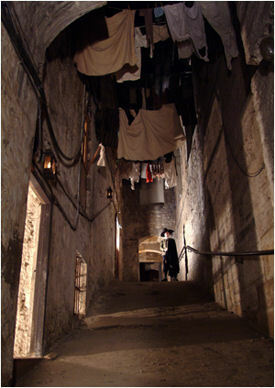 As mentioned in my post yesterday, closes are narrow alleyways that connect busy streets to courtyards and other streets, and often have steep slopes. In the 1600s, on either side of these narrow streets were tenement buildings that stretched up to 7 stories. During this time, Mary King was a widowed mom of 4 and business woman, taking in sewing and trading in fabrics. 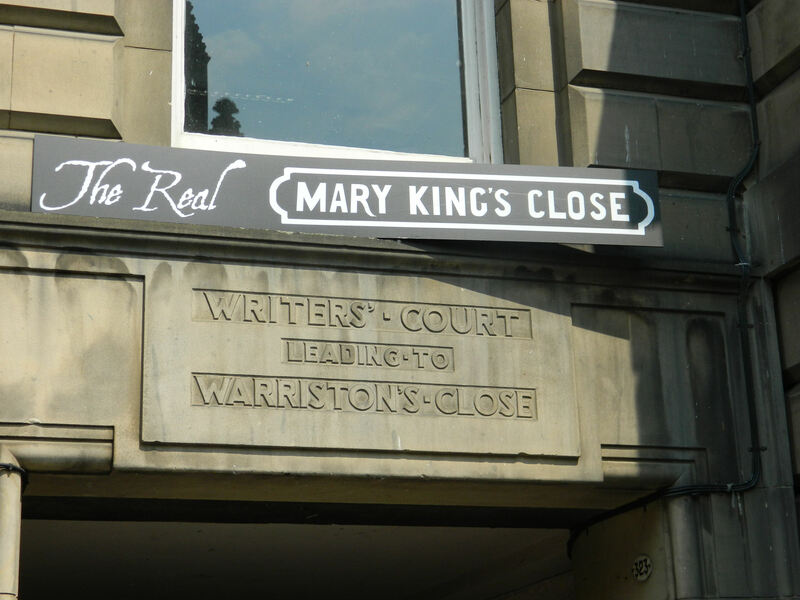 Because closes weren’t often named after women, the historians agree that Mary must have been highly respected in the community. During her time, the various interlocking closes and tall tenements were on the main level of the city, but over time new structures and streets were built literally on top of the old ones. Why? Well, that’s been discussed for years. Some say it was simply a matter of logic. The Old Town area of Edinburgh is not very big, so when the time came to expand, it simply built up. Straight up. Whatever the reason, the fact is there’s now an eerie area underneath the Royal Exchange, made up of old home ruins and very dark streets that feel like tunnels. And it’s open to the public for a not-too-expensive admission price. 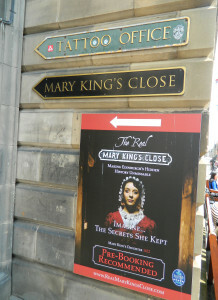 The day I went, I was told to meet the small group scheduled for the 1pm tour in The Real Mary King’s Close gift shop. There, an enthusiastic and very fun costumed guide greeted us and herded us through an old door and down the first of several stairways. The first thing I noticed as we kept descending was that the dank air got heavier and heavier, and several of the guests had to stop for a bit due to short bouts of dizziness. But almost all of us acclimated pretty quickly. The underground tour officially started when we stepped into a tiny 1-room domicile the guide said probably housed a family of 8-10. There was a small cook area, a corner sleep area, and… no bathroom. The guide explained that most families just threw pails of waste out their doors, and the sloping nature of the streets would roll it away. Eww! And just think about those poor people who lived at the bottom of the hill. This also made me realize that the plague hitting this area hard made complete sense. But my thoughts were interrupted while walking to the next home, when an older suit-wearing gentleman passed out and collapsed to the floor. He came to quickly, but with some breathing problems. Help was radioed for, and 2 large men soon arrived to assist him back to the top. I heard afterwards that he was fine after a short bit of sitting out in the air and drinking some water, but it’s a good reminder to be careful if you have any breathing or chest difficulties. Or problems in tight, dark spaces! Or with ghosts. We were told there have been talk of ghostly sightings down in the area since the 17th century, and frankly I can see how the mind could be convinced of that. It’s spooky down there! But interestingly, there are a few other hypotheses about why this might have happened. It could be that people are nervous because of the number of plague deaths and murders that happened there. Or, eerie “lights” could have been caused by biogas escaping from a near-by polluted marsh, or gas that often escaped into the closes could have caused hallucinations. Whatever, I was happy that the rest of my tour was just dark and mysterious and full of facts. And very, very interesting. That’s really all the drama I need! Glad that any possible ghostly things decided to give our group a break. 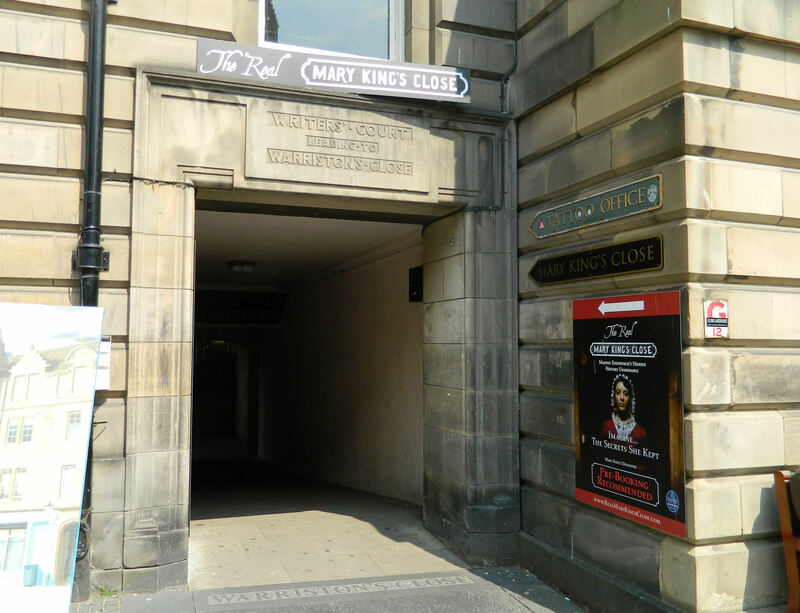 NOTE: Although the tour bills itself as being of Mary King’s close, ruins of the Pearson’s, Stewart’s, and Allen’s closes are also shown. Admission is around $21 for adults. The attraction is open 7 days a week but tours often sell out. So be sure to pre-order tickets online. ooooh, I am not a very brave soul either, but I’m sure for the adventurist, this could be a really neat place to visit. Possibly, I could go for a “short” tour in the day light, or bravely wait for my companions while they visit it. Good story and great video. Ha! I thought that at first too, but really the only scary things during the tour were when the gentleman fainted and when I felt the REALLY heavy air at the start. But otherwise it was just so interesting walking around and thinking that people once went about their daily lives there. If I (a definite scaredy cat) can do it, you could to! Don’t you love the old stories woven around ancient places? 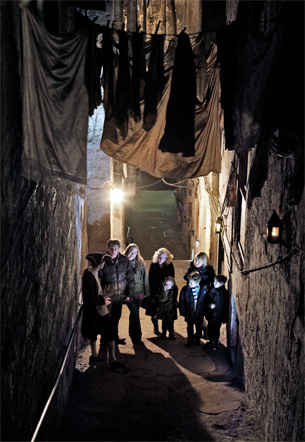 It would be interesting to go on one of the night time tours…for someone less claustrophobic than me, that is. One historical fact for those who fear bodies from the plague are buried in the walls of the close. Plague victims were typically buried in deeper than usual churchyard graves with full services as was the custom of the time until the churchyards began to fill. After that the church councils began paying to have mass graves dug. 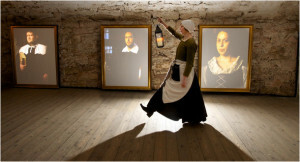 People at that time didn’t realize what caused the plague or how to prevent it consequently they continued to have full funerals exposing others in violation of the Plague Laws which forbid gatherings. It’s unlikely plague victims were walled into the closes but it make a heck of a good story. That was really interesting. Not sure I would have been brave enough to go. Then would probably always regret not going. Very nicely done Deborah. Ha! I’m not going to lie – I was nervous to go. But it was definitely worth it. And I think you’d enjoy it too.